Started martial arts at the age of 14 by practising karaté shotokan, 1st Dan. After his meeting with Séverin Corpataux, he starts to practise Jodo in 1988. He meets Pascal Krieger in 1992 at the 1st seminar in les Paccots. 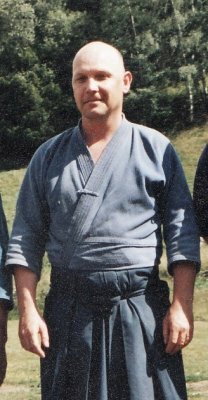 1st Dan in jodo in 1993. Received Oku-iri in Sevenum (Netherlands) in 2002 . Received the Gomokuroku certificate in 2016 during the summer camp.